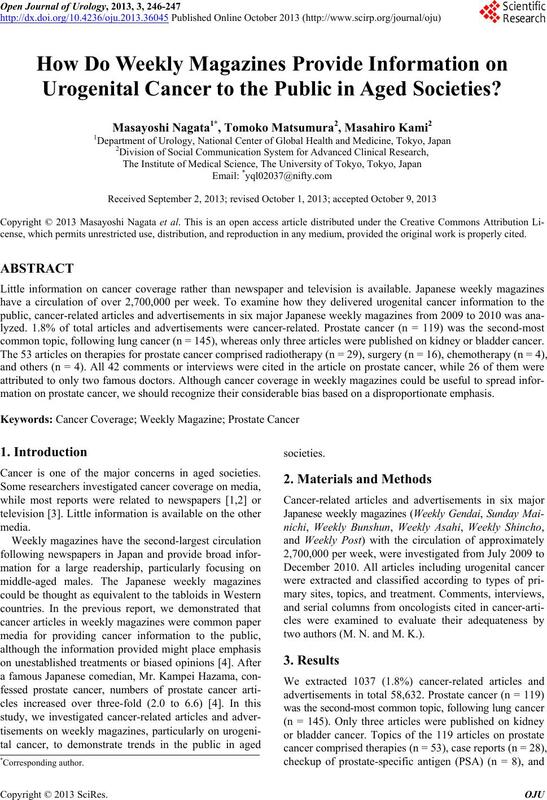 How Do Weekly Magazines Provide Information on Urogenital Cancer to the Public in Aged Societies? Urogenital Cancer to the Public in Aged Societies? common topic, following lung cancer (n = 145), whereas only three arti c le s were pu bl i shed on kid ney or bl ad der cancer. mation on prostate cancer, w e should recognize their considerable bias based on a disproportionate emphasis. Cancer is one of the major concerns in aged societies. two authors (M. N. and M. K.). Campaign”, appeared in magazines during the periods. doctors (a radiologist and an urologist). pivotal role in drawing publics’ attention to cancer. ble to previous reports in the Western countries [5,6]. cause prejudicial understanding in readers. zines and other countries’ magazines. 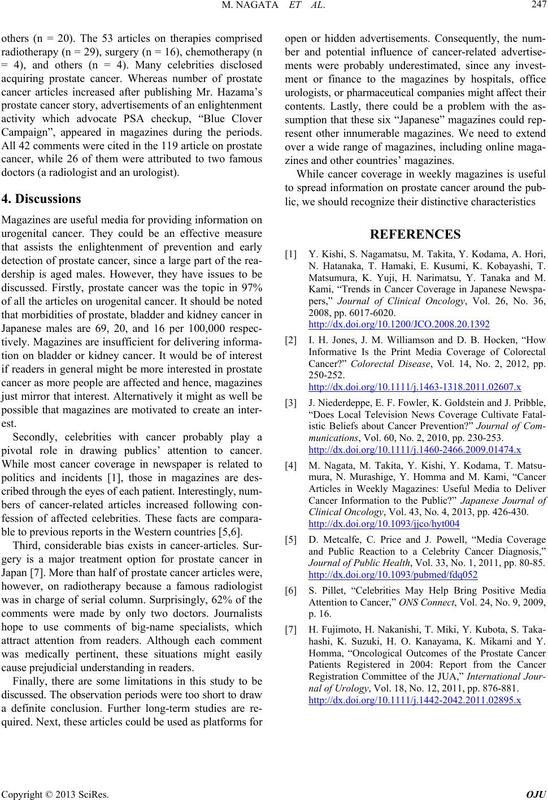 N. Hatanaka, T. Hamaki, E. Kusumi, K. Kobayashi, T.
Matsumura, K. Yuji, H. Narimatsu, Y. Tanaka and M.
Cancer?” Colorectal Disease, Vol. 14, No. 2, 2012, pp. munications, Vol. 60, No. 2, 2010, pp. 230-253. Clinical Oncology, Vol. 43, No. 4, 2013, pp. 426-430. Journal of Public Health, Vol. 33, No. 1, 2011, pp. 80-85.
hashi, K. Suzuki, H. O. Kanayama, K. Mikami and Y.
nal of Urology, Vol. 18, No. 12, 2011, pp. 876-881.